Sony to start making vinyl records again | What Hi-Fi? Buoyant sales have caused the Japanese technology giant to restart vinyl record production for the first time since 1989. If you needed more proof that the vinyl resurgence is real, Sony - one of the world's biggest technology companies - is to start making vinyl records again. The format's current popularity has prompted Sony to restart its production line for the first time since 1989. Back then, Sony abandoned vinyl in favour of the CD format, and outsourced its vinyl production to Japanese company Toyokasei Co. and foreign firms. Sony Music Entertainment (Japan) - a subsidiary of Sony - recently installed a vinyl press at a factory in central Japan. According to Sony, the unit had already set up a record cutting machine to make lacquer masters at a Tokyo recording studio. According to Agence-France Presse, Sony's records will include older Japanese music as well as contemporary hits. They should start rolling off the production line by March next year. Sales of vinyl records are on the rise, recently hitting a 25-year high. This prompted HMV to reopen its shop in the Shibuya district of Tokyo two years ago, with 60 per cent of the shop dedicated to vinyl. 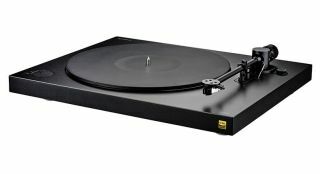 Last year, Sony also released its first turntable in eight years (pictured).